As many of you know from my profile, when I'm not creating miniatures, I am a freelance graphic designer. My specialty is packaging design (boxes, bags, cans, etc.). 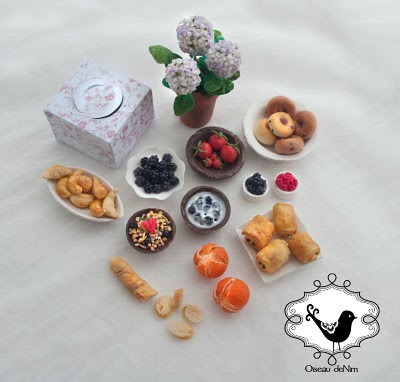 When Peiwen of Oiseau deNim contacted me about doing box designs and a logo for her work with polymer clay foods, I readily accepted the invitation. Not only have we come up with some fun items, but we've developed a friendship as well. Please take a look at what Peiwen has sent me. Her work is breathtaking. I feel honored to not only have her pieces in my collection, but to call her my friend. I call this Breakfast with Peiwen. It makes me imagine that we are dining together al fresco in beautiful France! My camera cannot capture the detail in her work. These items are simply stunning! I think I will have to create a new garden room to accommodate them. The logos and cake box are from our collaboration. Peiwen lives in France and much of her work is inspired by French cuisine. "Oiseau" in French means "bird". She wanted to capture the meaning of her business name and the whimsical, feminine appeal of her work in her logo. Many of her boxes have lace designs; therefore she wished to include lace in her logo as well. This is the mouth-watering Passion Fruit Macaroon Charlotte. It fits nicely into the box that she requested from me. Notice how the handles form an "O" like "Oiseau". That is typical of Peiwen's attention to detail! She added the pretty floral motif to the box. Thank you, Peiwen, for your beautiful gifts and for allowing me the opportunity to work and play with you! The passion fruit macaroon charlottes are currently available for purchase from Oiseau deNim's Etsy shop. Oiseau de Nim, hace verdaderas maravilas. El pastel de macarons es una preciosidad. Y enhorabuena por tu gran trabajo, un precioso envase para una preciosa mercancia. Muy buenos envases para tan buenos pasteles. Las dos haceis unos trabajos muy bien terminados. Oiseau food is absolutely wonderful; the box and logo perfect! Carol, You have made an incredible trade! 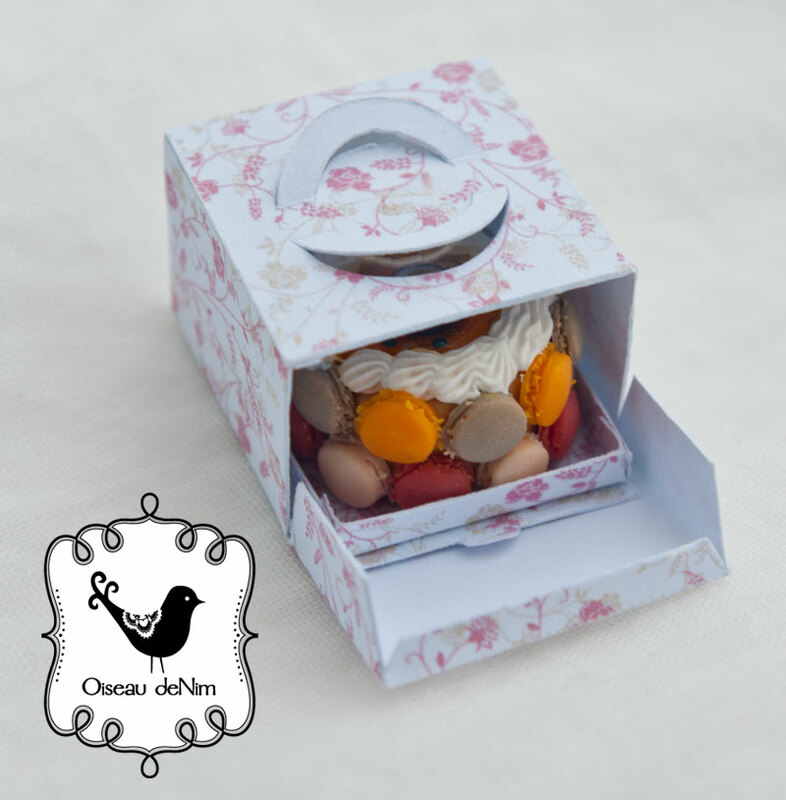 I love your logo that you have designed and have always loved what Oiseau creates! Her food looks so incredible and I can only imagine what it looks like in person!! You two collaborated together perfectly!! I love the bird that you designed! WOW! 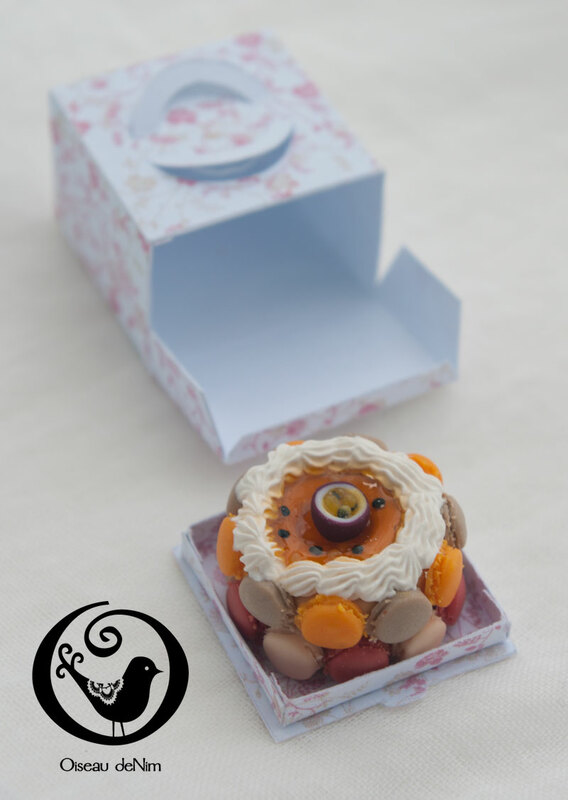 I have always admired her work with food in polymer clay. These pieces are gorgeous!!! The box you have designed is equally beautiful. What a great pair you make collaborating to create such lovely pieces. Es asombroso lo real y apetecible que queda todo. La caja con el logo es preciosa, las dos forman un tandem perfecto. The new packaging is really beautiful, well done! And OMG, you're so lucky to have received all those breathtaking minis! The food is fantastic and the logo that you create for she is very cute! Wonderful gifts, congratulations, are autentic treasures! Veo que ya estás preparando la tarta para enviarmela, hummmmm que rica.